The French Open 2019; the stars of tennis battle it out on clay! From May 26th to June 9th, 2019, we will see a clash of tennis titans at the French Open at Roland-Garros in Paris! You’ll thrill to the world’s top players battling it out on clay, the most challenging of playing surfaces. 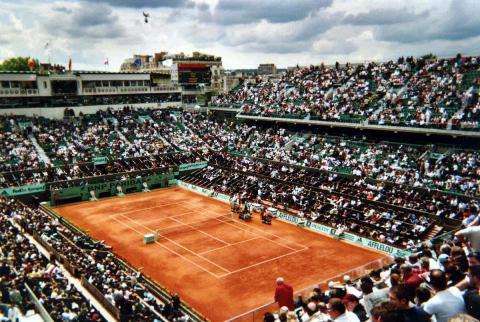 The Hotel Passy Eiffel, ideally situated for getting to the Stade Roland-Garros, welcomes you and invites you to book your tickets for this Grand Slam tournament contested on the legendary clay courts of the Porte d'Auteuil. Since its first edition, the French Open tennis tournament has grown considerably in size and scope and the event now hosts on its 24 courts several hundred tennis virtuosi hoping to win one of the nine Grand Slam trophies. Everyone remembers the 2018 edition, which ended with a record-breaking eleventh victory for Rafael Nadal, and Simona Halep beating Sloane Stephens in a gruelling and lengthy battle to lift the Suzanne Lenglen Cup. Is the Majorcan clay court maestro on his way to a 12th title? Will Simona Halep repeat her stunning performance? Can Cori Gauff, who at 14 years old last year became the youngest French Open junior winner since Martina Hingis in 1993, repeat her stunning achievement? Each year the tournament attracts tennis-loving celebrities from the worlds of politics, movies, music, TV and sport. Among the fans of the tournament are the actors François Berléand, Patrick Bruel and Bradley Cooper. The singer Nolwenn Leroy often comes to watch a match or two with her partner, the retired tennis professional Arnaud Clément. In 2018 we also saw the famous models Marine Lorphelin and Alicia Aylies, as well as the former boxer Mike Tyson, who enjoyed a sunny afternoon. Are you attending the tournament for the first time? Please note that all booking is online only; no ticket sales take place on site.